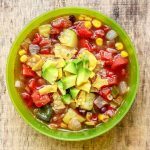 My very favorite camp meals to make are soups. They are easy to make, require only one pot, and keep you warm when the temps start getting low as the sun sets. 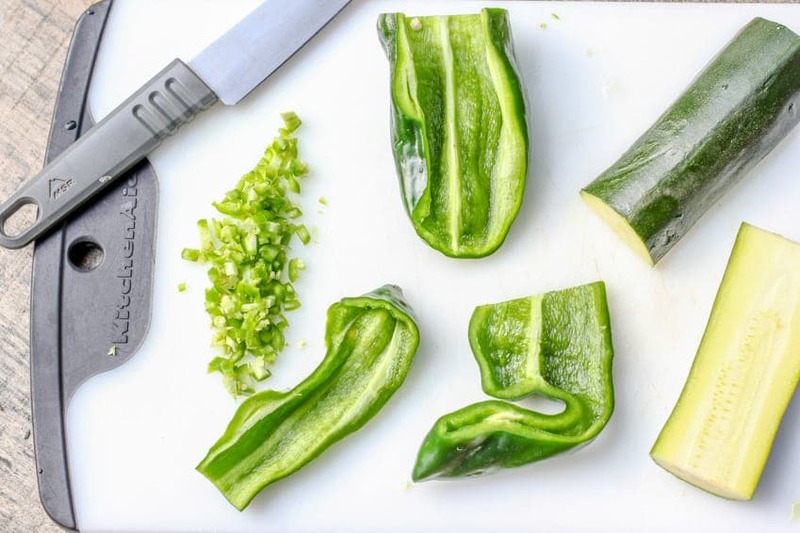 Plus, aside from the vegetable chopping and initial stir-frying, soup is pretty much hands off. I’ll make soup year round, no matter the temperature. At home, I love to make big batches that turn into leftovers for days to come. Of course, leftovers are a little more tricky in the outdoors, but I’ll often store any extra soup in an insulated food canister and eat it for lunch the next afternoon. 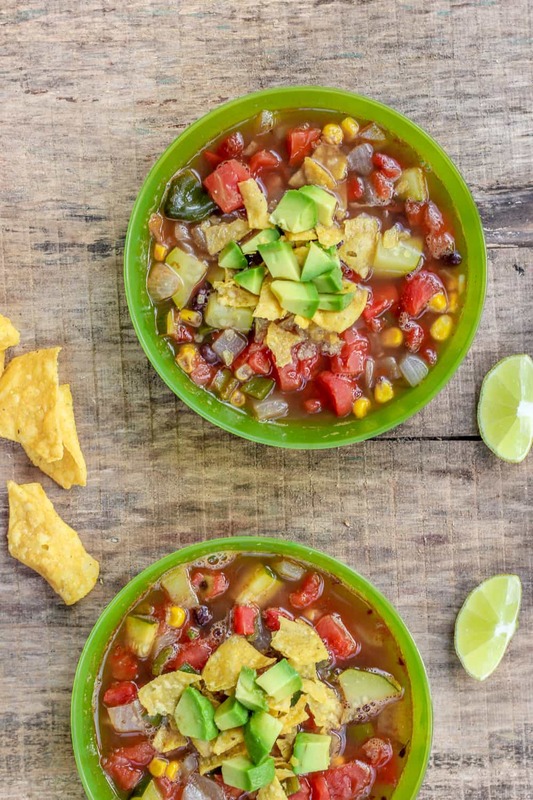 One of the first soups I make as soon as the summer turns to fall is Mexican tortilla soup. The spices keep me warm in the crisp air and there’s just something about holding a bowl of hot soup that brings on a sensation of coziness. 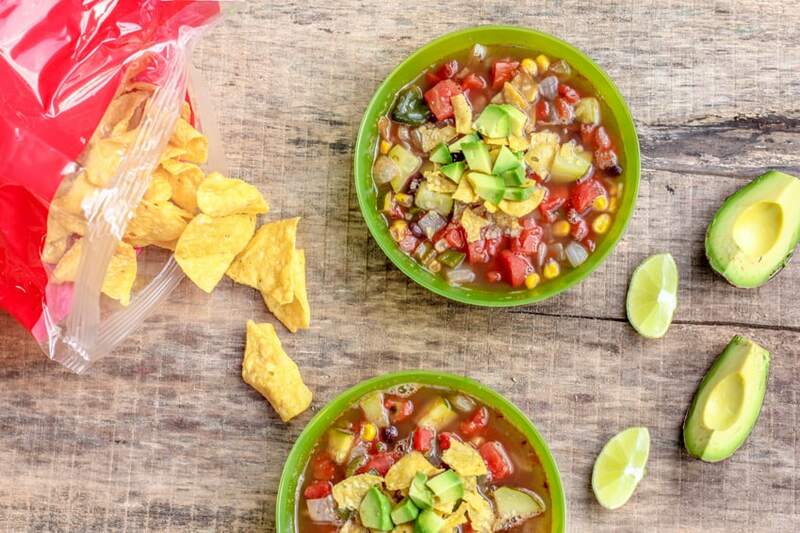 This Mexican tortilla soup is great to make after a long day of cycle touring or hiking when you want to make the most of your autumn outdoor adventure as the days become shorter. Adjust the level of spiciness to your preference, and don’t skimp on topping the finished product with crunchy tortilla chips! I like to crumble in a few at a time so they stay crunchy with each bite. Adding avocado adds a nice creaminess to the soup and finely diced onions provide a little bit of a bite with every spoonful. Add oil to a pot and heat over medium heat. Once hot, add onion and garlic and saute until translucent, about five minutes, stirring frequently. 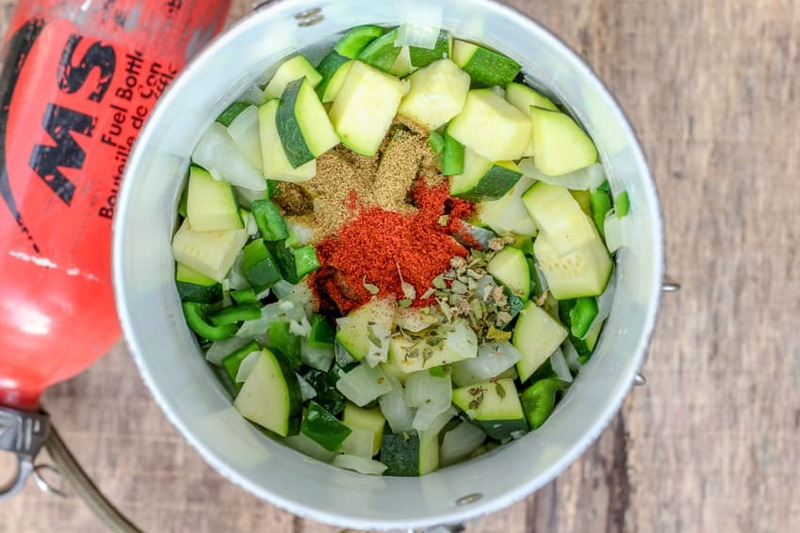 Add the peppers, zucchini, and serrano pepper and saute another 4-5 minutes. Add the cumin and chili powder and stir to coat, continually stirring until fragrant, about 30 seconds. Next, add the water or vegetable broth and tomatoes and bring to a boil. Reduce to a simmer and add the beans and corn, if using. Cover and simmer for 20-30 minutes. The longer it simmers, the more flavorful.